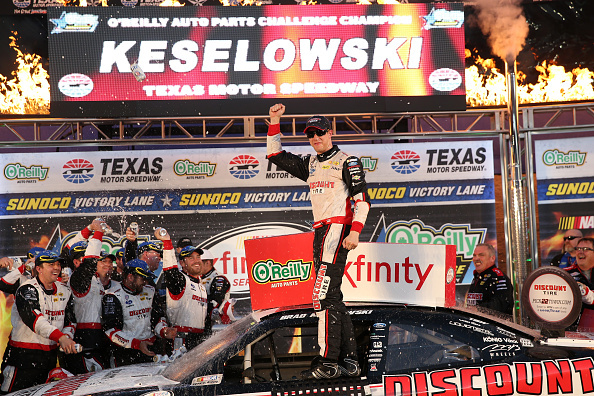 FORT WORTH, Texas – Brad Keselowski’s love affair with the Lone Star State continued in full force on Saturday with a hard-fought NASCAR XFINITY Series victory in the O’Reilly Auto Parts Challenge at Texas Motor Speedway. Keselowski grabbed the lead from Coors Light Polesitter Austin Dillon on Lap 189 of 200 after a restart with 16 laps left in the race. The No. 22 Team Penske Ford finished 1.137 seconds ahead of the No. 88 JR Motorsports entry driven by Kevin Harvick, who passed Dillon for the runner-up spot with four laps left. The victory was Keselowski’s second of the season, his second at the 1.5-mile speedway and the 34th of his career. The eighth win of the season for the No. 22 Ford (accomplished by Keselowski and teammates Joey Logano and Ryan Blaney) clinched the third straight XFINITY Series owner’s championship for Roger Penske. In his last four starts at Texas, Keselowski has won twice and finished second twice. In his last 12 XFINITY Series starts at the Cowtown track, Keselowski has posted 11 finishes of seventh or better. Victory Lane, however, hardly seemed a likely destination for Keselowski in the early going. Harvick and Kyle Busch dominated the opening laps and came to pit road running 1-2, respectively, for pit stops under caution on Lap 79. 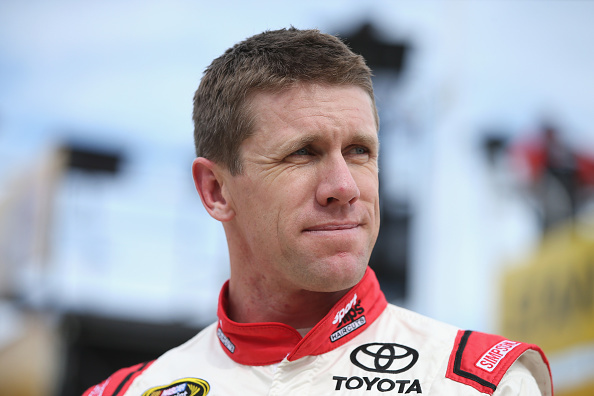 But a broken shifter proved Busch’s undoing, as his No. 54 Toyota was limited to fourth gear and fell out of the running for the victory. Under that same caution, the second of the race, Harvick returned to pit road twice because of a loose wheel and spent the bulk of a subsequent 34-lap green-flag run regaining the positions he lost. Kyle Larson also took a turn at the front of the field, leading 50 laps before a tire rub finally popped his left rear on Lap 176 and sent his No. 42 Chevrolet spinning through the tri-oval and out of the lead, handing the top spot to Harvick, who was in close pursuit. Harvick came to pit road with the lead but left in third place under caution on Lap 181, leaving Keselowski and Dillon to battle for the top position after a restart on Lap 185. “First off, Austin Dillon was really good and he was one of the toughest guys to beat,” Keselowski said in Victory Lane. “He ran a heck of a race. Harvick looked really good, Kyle Busch looked really good and Kyle Larson I thought was going to run away with the race until he had that flat. Erik Jones ran fourth behind Keselowski, Harvick and Austin Dillon, with Ty Dillon taking the fifth spot. Chris Buescher came home 11th but moved closer to the series title. With two races left, he leads eighth-place finisher and reigning series champ Chase Elliott by 24 points. “It isn’t comfortable yet,” Buescher warned. 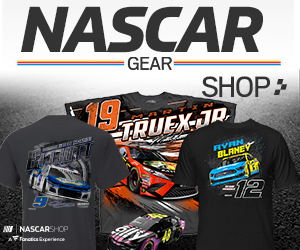 “It is a cushion that we have, and I guess you average that out to 12 spots per race, so if we go out and finish top-10 the last two, we should be in good shape. 1. (2) Brad Keselowski(i), Ford, 200, $74829. 2. (8) Kevin Harvick(i), Chevrolet, 200, $56590. 3. (1) Austin Dillon(i), Chevrolet, 200, $47982. 4. (3) Erik Jones(i), Toyota, 200, $43341. 5. (9) Ty Dillon, Chevrolet, 200, $35321. 6. (5) Daniel Suarez #, Toyota, 200, $33389. 7. (11) Brian Scott, Chevrolet, 200, $30662. 8. (10) Chase Elliott, Chevrolet, 200, $30590. 9. (4) Regan Smith, Chevrolet, 200, $28454. 10. (14) Elliott Sadler, Ford, 200, $30317. 11. (12) Chris Buescher, Ford, 200, $26711. 12. (13) Brendan Gaughan, Chevrolet, 200, $26155. 13. (18) Ryan Sieg, Chevrolet, 200, $25624. 14. (6) Kyle Busch(i), Toyota, 200, $19195. 15. (17) Ryan Reed, Ford, 200, $25567. 16. (24) Ross Chastain #, Chevrolet, 200, $24841. 17. (20) Jeremy Clements, Chevrolet, 200, $24715. 18. (19) Dakoda Armstrong, Ford, 200, $24589. 19. (7) Darrell Wallace Jr. #, Ford, 199, $24462. 20. (23) Ryan Truex, Ford, 199, $24836. 21. (25) Blake Koch, Toyota, 198, $24210. 22. (21) Landon Cassill, Chevrolet, 198, $24078. 23. (15) JJ Yeley, Toyota, 197, $23927. 24. (26) Mason Mingus(i), Chevrolet, 195, $23775. 25. (32) David Starr, Toyota, 194, $23774. 26. (30) Joey Gase, Chevrolet, 193, $23497. 27. (22) Ray Black Jr.(i), Chevrolet, 192, $23371. 28. (33) Eric McClure, Toyota, 190, $23245. 29. (38) Martin Roy, Chevrolet, 190, $23169. 30. (29) Derrike Cope, Chevrolet, 189, $17419. 31. (37) Derek White, Chevrolet, 188, $23063. 32. (39) Mike Harmon, Dodge, 180, $23002. 33. (16) Kyle Larson(i), Chevrolet, Accident, 178, $16962. 34. (35) Harrison Rhodes #, Chevrolet, Engine, 102, $22927. 35. (31) Morgan Shepherd, Chevrolet, Handling, 42, $16863. 36. (28) Mike Bliss, Toyota, Transmission, 40, $21200. 37. (36) Josh Reaume #, Dodge, Suspension, 14, $14200. 38. (27) TJ Bell(i), Toyota, Electrical, 12, $19200. 39. (40) Mario Gosselin, Chevrolet, Vibration, 9, $12200. 40. (34) Jeff Green, Toyota, Transmission, 4, $11200.